The 3rd May proved to be an exciting and esteemed night for Conigital where they won the Best Newcomer Award at the 2018 West Midlands Business Desk Master Awards. 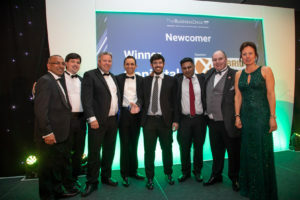 The Awards were held at Edgbaston Cricket Ground, where Paul Bassi, Bond Wolfe founder and Real Estate Investors Chief Executive, who was named as the 2018 Ambassador was in attendance. Headline Sponsor, MHA MacIntyre Hudson will be hosting a winners’ dinner later this month. Conigital in the last 2 years has successfully secured UK Innovate Funding to develop sensors and technology for the growing connected autonomous vehicle market to further improve connectivity, mobility and accessibility. The development of Conigital’s solution is being funded by three projects: Project CAPRI worth £5.7 million, Project Synergy worth £4.7million and Project INSIGHT worth £2.2 million. Each collaborative project includes a range of partners and clients such as Queen Elizabeth Olympic Park, Manchester Airport, Birmingham Airport; Heathrow Airport and The Mall Shopping Centre in Bristol. Each project is funded by the UK government and feature cutting edge connected and autonomous vehicle solutions. Conigital provides a mobility solution for high traffic destinations such as airports, hospitals and business parks. They provide an end to end platform that enables connectivity and autonomy for the full range of vehicles at these locations that supports the full range of vehicles providing passenger transport, support services and freight deliveries. A key focus for the company is developing cutting-edge technologies for good to create zero emission transport solutions, ensuring mobility, social inclusion and a greener environment is available to all citizens. They believe in “tech for good” and a key focus is to ensure that elderly and visually impaired persons can access the full range of transport services. Conigital works closely with the Beacon Centre for the Blind, a UK based blind and partially sighted charity to ensure services meet the needs of their community. Further recent success has been through being a Founder of Midlands Connected Autonomous Vehicles (MCAV), recently produced their second event of the MCAV event series, inviting James Palmer, the Mayor of Cambridgeshire & Peterborough and Andy Street, the Mayor of West Midlands to be keynote speakers at a dinner for 130 people to connect and promote companies and individuals working in the emerging driverless sector estimated by KPMG to be worth £51 billion per year to the UK economy by 2030 and create 320,000 new jobs.